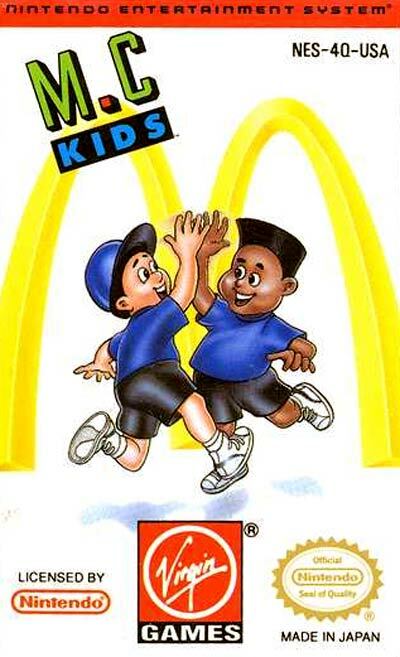 Mick and Mack are the two hippest kids in McDonaldland how they got there, nobody knows! But after the Hamburglar makes off with Ronald's magic bag, it's up to the M.C. Kids to retrieve it. You'll come face-to-face with bad guys like Goferit and Psycho as you try to solve the puzzles that will lead you to the Hamburglar and Ronald's bag. Run, duck, and throw your way through 30 levels in seven worlds that will call for you to raft across a lava river, skid across an ice bridge, and even set down on the moon! There's a Two-Player Cooperative mode if you're feeling overwhelmed, but if you want a real challenge, try playing the game in the Upside-Down mode! It's time to head to McDonaldland and help find Ronald's missing magic bag in M.C. KIDS.